Be the first to share your favorite memory, photo or story of Almeda. This memorial page is dedicated for family, friends and future generations to celebrate the life of their loved one. Almeda was born October 13, 1923 to Dr. John Robert Williams and Ida George Williams in Kansas City, Missouri. She was the fourth of five children. Almeda attended Lincoln High School in Kansas City, Missouri. 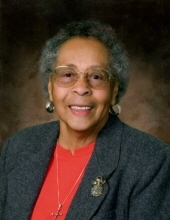 After graduating from high school, she attended Lincoln Jr. College graduating in May of 1942. She began working at a filling station pumping gas and for training until her move to Denver Colorado, where she lived with her older sister Muriel and her husband. She was surprised to find out she had a job and could go to school that September. Later that year, she went to work for the Department of Defense as a machinist assistant at Hill Air Force Base, Ogden UT. Almeda married Chancy N. Peterson on May 9, 1943 in Ogden, Utah. Following the war, and after Chancy’s honorable discharge from the Army, Chancy, Almeda and their young son Ray moved to Denver where they lived and raised their four children; Ray Norman, Marva Jean, Gilbert Alan, and Chauncey Lawrence. 30 years of service on January 31, 1983. Grandchildren: Sean and Stacy Peterson Brooklyn NY; Janae and Joben Lewis Centennial, CO; Markita and James Curry, Commerce City, CO; Lynniah Taylor, Denver, CO.; Yvette and John Breece, Denver, CO; Jaimie and Dylan Brown, Thorton, CO; Kayla Grayson, Arvada, CO; Brianna and Canon Teague, Cleveland, MO. Great grandchildren: Janae, Marcus and Jamon Curry, Kenna and Abigail Breece, Sienna Teague, Jacob, Joseph, Jaymir, Lyrissa and Auset. A host of loving nieces, nephews and friends. To send flowers or a remembrance gift to the family of Almeda Peterson, please visit our Tribute Store. "Email Address" would like to share the life celebration of Almeda Peterson. Click on the "link" to go to share a favorite memory or leave a condolence message for the family.